Work on the new Calgary offices of UFCW Local 401 is in full swing as construction continues throughout the summer months. The new office will serve as the union’s headquarters and will be located on McKnight Boulevard, just a few blocks from the current location in Calgary’s Northeast end. As explained by UFCW Local 401 President Doug O’Halloran, this is a project that has been in development for some years now. “This has been a process that began back in 2001 when land was purchased by Local 401 on McKnight Boulevard, said President O’Halloran. “The land was purchased with the vision of building an office in Calgary for our membership that could become a house for the members. It will also encompass the ability to have a focal point for the labour movement in Calgary,” stated President O’Halloran. “UFCW Local 401 settles 97% of our contracts without a strike, and while this is good, this leaves space for us to prepare for the big battles that might be coming our way, and this new building will allow us to do that,” said President O’Halloran. 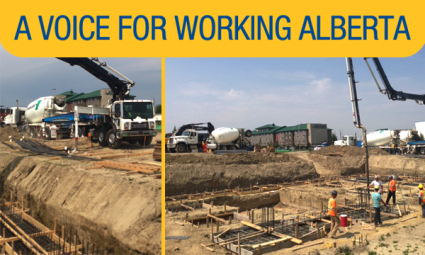 Stay tuned for more updates soon on the construction of the new UFCW Local 401 Calgary headquarters. In the meantime, if you are in the area you can drive by and have a sneak peek at the progress.